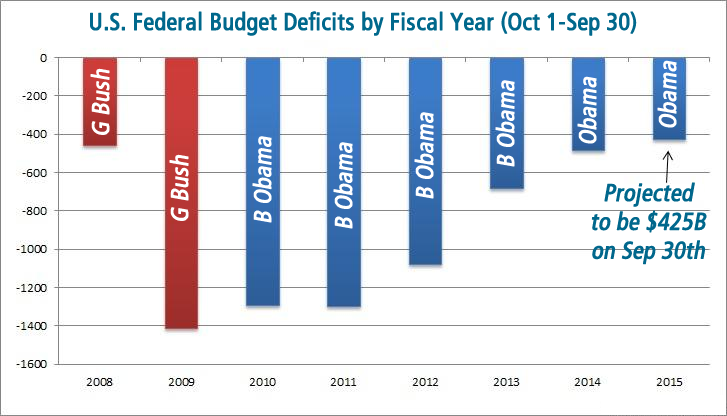 Before you start believing the drivel Republicans are spreading about rising deficits, maybe you need to understand the difference between two terms that are frequently used in error: overall National Debt and the Federal Budget Deficit. Republicans are counting on 93% of the population apparently not understanding that there’s a difference between the two. Let me start by explaining both terms from a family budget perspective. If you have a monthly income of $1000.oo, but you have bills and expenses of $1,200.00, you have a $200.00 “budget deficit” that most folks will have to carry on a credit card, hoping to pay it off during the upcoming month. If on the other hand, you continue having $200.00 deficits for months on end, the deficit remains at $200, but your household debt begins to rise on that credit card by $200.00 (plus interest) each month. So, in 12 months, the budget deficit is $200, but the household debt is $2400 (plus interest). Now that you better understand the difference between the two terms, the next time your crazy wingnut friend tries to echo the Republican mantra that deficits are rising, please take the time to educate them. If all else fails, please tell them they deserve a lengthy time-out in some dank corner.